If you’ve been following the pink slime story, you know that it has gotten huge. 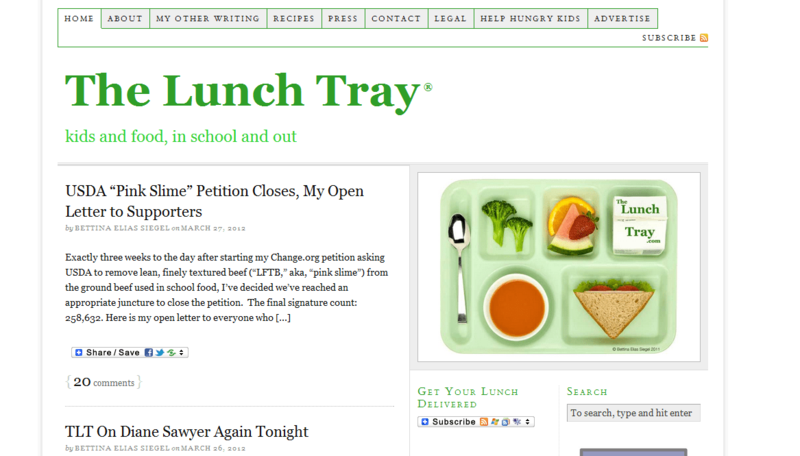 I find it interesting because important people like Michael Pollan and Jamie Oliver have been talking about it for several years, but it didn’t gather any momentum until Bettina Elias Siegel from The Lunch Tray started a petition on Change.org earlier this month. I believe that it is the result of Bettina’s petition (and the resulting media firestorm about this issue) that catapulted “finely textured beef” into public dialogue. And it’s gone way beyond being just online. Discussions about pink slime are happening in my community. At the doctor’s office I overheard people talking about “pink slime” and at the grocery store some customers asked the butchers about the beef. It’s everywhere. It’s all fun and games until people start losing their jobs. The above article stated about 650 employees are at risk. I empathize with the workers who may or may not permanently lose their jobs because those factories are closing. That’s truly heartbreaking. It’s important to clarify that Bettina from The Lunch Tray was not demanding that Beef Products International (BPI) immediately close up shop. She just wanted finely textured beef (aka “pink slime”) off of school lunch menus. What happened was that other people realized that the filler was in more than just the hamburgers in some school lunch cafeterias, but it was in ground beef at local grocery stores, too. It’s yet another reminder of how powerful the internet is. I remember way back when my blog went viral. I learned that you can never know what can happen when you put something online. I’m so proud of Bettina’s bravery with her petition and her courage and grace in handling the media coverage. I think she spoke up in a positive way that did not target any particular company in a malicious way. What it turned into was a very successful raising awareness campaign. I think that Beef Products International (BPI) will need to retool their business model. Instead of fighting the tsunami of public sentiment that is not in favor of their product, they need to accept what has happened and move on. Hey, I’m not saying it’s not easy, but I think it’s time for reinvention. Is there a market for this product in pet food? My dog Fenway would eat it, though he would prefer it unprocessed — he likes to chew on big old bones (I gave him an elk ‘knuckle’ this past weekend). Or BPI should diversify and move in a new direction away from “beef products.” Now is the time for change. A local grocery chain just posted on FaceBook a few days ago that they would no longer source ground beef with Finely Textured Beef in it. Heck. If McDonald’s of all places stopped using pink slime because of public outcry then it’s almost criminal that anyone else continued to use it. People just want to know what’s in their food. It should NEVER have been allowed that pink slime could go unlabelled. If it becomes a legal requirement to identify pink slime as an ingredient on meat labels (for example “up to 15% ammoniated beef trimmings”?) I’m sure there are still people who will still buy it, since it’s cheaper by a few cents per pound. But if you wanted to avoid it, you could, just by reading the label. I’m glad schools are finally getting rid of it, though. I’m really hoping this whole pink slime issue really makes food companies like BPI change their tactics in the future. They should think twice about dreaming up foul ways to cheapen food, and then trying to slip it in under the radar, just for the purpose of making $$$. Lying and hiding things just ends up being more expensive in the end, doesn’t it? Outrage is costly. People need to know, though, that food industries will continue to try and get away with not telling the public what exactly is in the food. Cloned meat? Hormones? (Dairy lobbyists almost successfully suppressed the ability of dairies to put “no added hormones” on their milk cartons.) This is a horrible trend that we all need to be vigilant about. Nobody shuts down 3/4 of a billion-dollar operation in less than a month – the public outcry against “pink slime” is simply a convenient scapegoat. There are two major issues with BLBT: one, that it may not have the same nutritional content as muscle meat due to a high proportion of connective tissue. This should still be addressed via testing and labeling. The second issue: the possible pathogen content, could be addressed simply by cooking the product instead of gassing it. I can’t imagine that it’s hard to re-tool a factory to do that. No need to shut down plants or lay off workers. Beef Products, Inc. seems more interested in finding a scapegoat than saving the employees entrusted to its care. I generally buy the little ground beef we eat from local farmers (though I recognize I’m lucky to be able to do so). When I do have to buy at the grocery store, I ask the guy behind the counter which of the various types of ground beef they grind in the store. It’s usually just labeled “ground beef” as opposed to ground round, etc. Being ground in small batches, removed from the carcass, means less risk of pathogens. Plus it’s often better quality, since it’s made up of leftovers from all the cuts they prepare in-store. While I’m sorry for the BPI employees who may find themselves out of a job, there is another side of this coin, and one that hits close to home for me. My husband is a butcher by trade, with 17 years at his company. The last few years, his department has been systematically whittled down as the company tries to implement more and more processed, pre-packaged meat and meat products, including pre-formed hamburger patties made off site. With the public backlash against “pink slime”, it actually means more job security for him and the people in his department company-wide, as there is more demand for in-house, fresh-ground beef. In my house, this particular bit of public awareness is a relief. “Pink Slime” is beef. Beef is beef period. BPI is a reputable company that complies with FDS and USDA regulations. The real name is textured beef protein, which is 90%+ lean beef. So you you are buying 90% lean beef, then you are likely eating it. People are confused about the ammonia treatment. It is a gas, not a liquid. A lot of foods already have this in it, some naturally. I don’t think anyone would want to eat an egg if we called it a “unfertilized ovary” , or drink milk if we called it “cow teat juice”. So, this is a big hype, one that will blow over. Why should it be labeled? Do you want to know all of the cuts that went into the ground beef? Do you want the cheese labeled as to what milk is used, or the tomato sauce knowing if it was vine ripened? No one has gotten ill from BPI. We should be using all available resources that science provides us, smaller carbon foot prints are good right? It’s bothering me that people are in an uproar over this textured beef product. I have read about how it’s made and all the steps that ensure that it’s safe for the consumer to eat. These companies are doing what they can to help people and businesses to keep costs down. Not everyone can afford farm raised beef. A lot of people use the 5lb roll of beef from the grocery stor to feed their family. It’s a lot cheaper for them. With the costs of groceries going up and up, families won’t be able to afford much of the way in the meat dept. I know people are going to say go meatless but that’s not always an option for some families. I defend your right to eat as much pink slime as you want. We all have a right to make decisions for ourselves about what is acceptable or not acceptable to eat. Why would you object to labelling? It doesn’t have to be called pink slime, come up with whatever euphemism, but it should indicate to consumers that they are getting some percentage of ammoniated connective tissue. If the fear is that people will avoid buying pink slime altogether, then what you really fear is the free market. Again, we all should have the right to know what is in products so we can make informed decisions whether or not to buy them. In this same vein, failure to identify the presence of pink slime also deprives the consumer of the ability to evaluate fair pricing. Pink slime is cheaper than actual cuts of muscle meat; I’d expect to pay more for a ground beef mixture of expensive cuts and no filler. By hiding the pink slime, you obscure the true value of the product. Brilliant comment — thank you! I have a problem with the fact that whomever “they” may be, they have hidden this product from nutrition labels. IF it’s harmless, why would they feel the need to hide it. It’s not a matter of laziness, it’s outright LYING. We’ll see in 30 years what the consequences are. And I lost ALL respect for the FDA when they declined to begin banning BPA from canned goods, that’s like declining to keep your child from eating the dog’s presents in the yard. you may want to google “meat glue” and you’ll be surprised there as well. I am seriously considering buying a farm and growing my own meat and veggies. Kari – your right about the meat glue. Kraft and many other food processors are using meat glue in their dairy products, especially non-fat and low fat,, in order to make their yogurts, cheeses, cottage cheese, etc. thick and creamy. The meat glue, called Activa, is banned in Europe, but the US allows it and we are all guinea pigs. It doesn’t even have to be on the label because technically it’s not considered an “ingredient” but a processing agent. Never mind it ends up in our food. I even found out it’s being used in breads to improve texture. Can we not get away from these Frankenfoods? !